Robot Cache is unique for a heavy-handful of reasons. But jump on the interwebs for a quick minute, and you’ll find one term looming above the rest: blockchain. Now there’s a chance this mining part might sound confusing, technical, or even not worth the effort. Mining, after all, is usually reserved for those with a crypto wallet, and their PC specs memorized. But forget all that, because Robot Cache makes mining for IRON as easy as pushing a button. What do I get from mining? One of our goals is to take the mystery out of mining. Like other video game distribution platforms, you can use real money to purchase games. But one of our unique features is to offer mining on an opt-in basis. 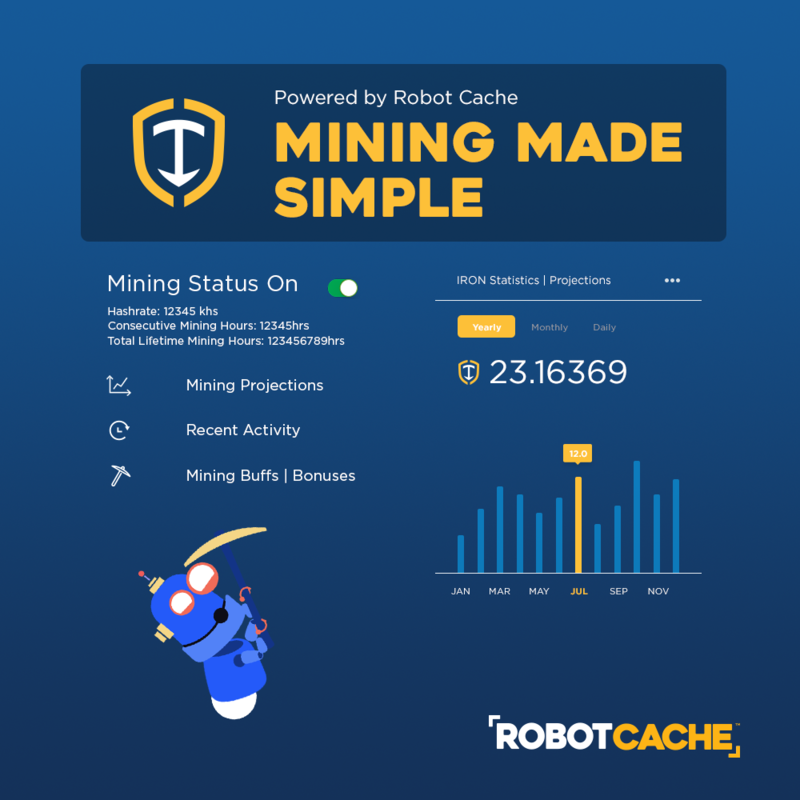 As Cachers opt-in to enable mining, we direct them towards optimized mining pools that Robot Cache manages and they, in turn, are rewarded in IRON, which is our virtual currency, to use towards game purchases. Once you’ve turned on the mining feature, you’ll notice that you will be accumulating small amounts of IRON as the pool is successful at solving the mathematical problems. If you are new here (welcome!) – IRON is not a cryptocurrency, but rather it’s Robot Cache’s platform virtual currency. Read more on IRON here. Once accumulated IRON can then be used to purchase games; it’s a great way to pay for your gaming habit. IRON can only be used on Robot Cache towards the purchase of games. You’ll be able to earn even more through rewards, buffs, and bonuses. To start mining, all that’s required is to download the RC client and turn the feature on. But you’ll want to do some homework. Electricity costs vary so widely throughout the world, even down to the city, so you’ll want to understand your situation since everyone’s is a bit different. You may live in a college facility or have solar where electricity costs are either not passed on to you or you’ve already paid for access to electricity powered by the sun. Or you may live in a country where electricity costs are extremely high. Or you live in a place where electricity is pretty reasonable! A tip…in some cities, power companies charge in a tiered manner where typically night time is off-peak and per kilowatt fees are substantially less, so the time of day matters too. Once you know your per kilowatt fees, you’ll want to explore your video card. All cards operate a bit differently in terms of their efficiency and what in particular they are good at. Typically, PC gamers have higher end cards to render the best graphics so chances are you’ll have a good one for mining, but you should absolutely check. Also, you should know that with some cards it does not make sense to mine as it will not be worth the effort. As we approach launch, we’ll publish helpful information, articles, and links so you have all the information and resources available to you. It’s important to remember however, that mining uses a large portion of your system’s processing power. So, it’s best to wait until you’re not using the computer to enable the feature. Maybe turn it on at night while you sleep and when electricity if often at off-peak rates. Or use 2 cards if you have a powerful enough machine – one for mining and one for gaming! Make sure you are one of the first in line to start mining! Sign-up to be invited to Early Access here. What’s this mean for you? Earn free games while you sleep, baby!